"We expected the light from quasars to vary from place to place at most by a factor of two at this time, but it is seen to vary by a factor of about 500," said lead author Girish Kulkarni, who completed the research while a postdoctoral researcher at the University of Cambridge. "Some hypotheses were put forward for why this is so, but none were satisfactory." During reionisation, when the universe transitioned out of the cosmic 'dark ages', the space between galaxies was filled with a plasma of ionised hydrogen with a temperature of about 10,000˚C. This is puzzling because fifty million years after the big bang, the universe was cold and dark. It contained gas with temperatures only a few degrees above absolute zero, and no luminous stars and galaxies. How is it then that today, about 13.6 billion years later, the universe is bathed in light from stars in a variety of galaxies, and the gas is a thousand times hotter? "When the universe was 1.1 billion years old there were still large pockets of the cosmos where the gas between galaxies was still cold and it is these neutral islands of cold gas that explain the puzzling observations," said Martin Haehnelt of the University of Cambridge, who led the group that conducted this research, supported by funding from the European Research Council (ERC). "This finally allows us to pinpoint the end of reionisation much more accurately than before," said Laura Keating of the Canadian Institute of Theoretical Astrophysics. 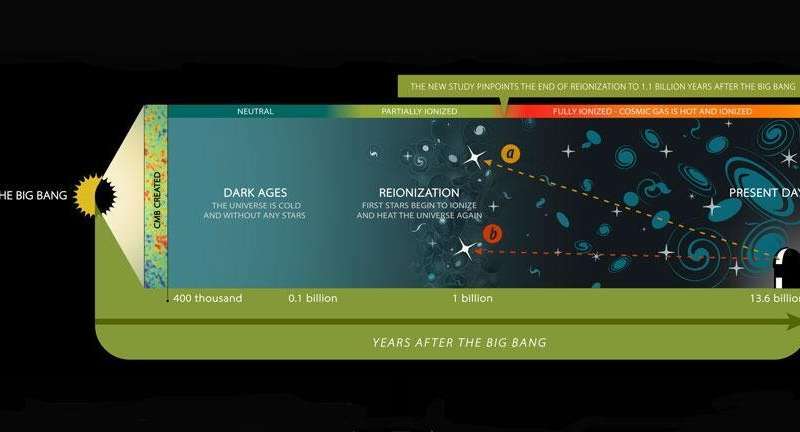 "Late reionisation is also good news for future experiments that aim to detect the neutral hydrogen from the early universe," said Kulkarni, who is now based at the Tata Institute of Fundamental Research in India. "The later the reionisation, the easier it will be for these experiments to succeed." doogs, i'd propose you get take classes at your local community college that covers a beginner's introduction to astronomy, cosmology & astrophysics. Turn off the woosites. As those fakirs will rot your intellect, while emptying your wallet & trying to steal away your teenage boy. If you are unsure as too the value of listening to grifters & gonifs? I'll bet your City Police or Sheriff's Dept or State Justice Enforcement have an office that can show you case examples of criminal behavior. & the damage they cause to their gullible victims. The nature of the physical space seems the most important subject in physics. A present paper proceeds from the assumption of physical reality of space contrary to the standard view of the space as a purely relational nonexistence - void. The space and its evolution are the primary sources of phenomena in Mega- and micro-worlds. Thus cosmology and particle physics have the same active agent - physical space. "The new study suggests that the universe was reionised by light from young stars in the first galaxies to form." Nice! That is more or less the basis for the model, so if it is a robust observation it solves an old question (and in a simple form). Doogs, you can safely skip the rrwillsj recommended community college classes and especially the expensive snob-physics/cosmology/SpringT schools of traditional relativity/QM theories promoted by the annoying and obsolete political science of GR/QM - a past religious force in destroying the efforts of mankind to reach the rank of competent and responsible cosmic community. See some internet freebies about education in Dynamic Universe in the web sites of physicsfoundations.org or lfs.fi or some of my past comments to the annoying rrMousie and yoghoord gulping pseudo-scientist C-astro charmer of past era JD. So, the Lord actually said -- Let there be reionisation -- and then there was light. Hope they remember to make that update in the next revision of Genesis. There doogs, annoyingmousie trying to seduce you away from an education. In your life, has anything you value ever been acquired without you paying for it? The fraud wants to lead you the bordello of poxed whores of the DUwoo. I will not be surprised if the DU bedlam is another of the chancre sores from the Trump University. Since the looneyticks constantly plagiarize & steal the hard work of real scientists? Before you give the crooks a penny? Demand proof of patents or academic standing or professional awards or peer-reviewed publications. Including living contacts at the research institutions the DU phonies are claiming as supporting their bunkum. Do not just assume their assurances are not fakir assinine. Do the background check just as thoroughly as you would do when your brother-in-law is asking to borrow more money. & he is certain this investment is certainly a sure thing, this time. Cause any plugnag named "Pet Food Reject" is a certain winner! Anyone doubting the science background of 'Suntola Dynamic Universe' web search results can also check Wikipedia search of 2018 Millennium Award in technology and past papers of international symposia of PIRT experts in relativity. I was able to load the e-book edition of DU free of charge from Suntola's web site and then invested some $ 20 to order its and other printed editions from Amazon - my best investment in understanding modern physics and related math sciences. See, I have been able to point out many mistakes of GR/QM supporters using my head rather than the standard click-and-paste arguments of rr, JD and other PO regulars. & yet none of these cracked teapotties have a single working invention based on their denial of the reality described by GR/QM. So , annoyingmousie is a freaking hypocrite. to communicate their dogmatic cant of childish nonsense. Maybe he?/she?/it? is using a ouiija board to talk to the rest of us?
" The fraud wants to lead you the bordello of poxed whores of the DUwoo." Said rr almost a year after I exposed the similar ignorance of TD about DU on the same day when TeknD (PhD, ScD) Tuomo Suntola was given the 1 M euro Millennium Award by President Niinistö for his decades ago invention of Atomic Layer Deposition (ALD) technology. ALD has enabled the continuation of Moore's law in computer nanotechnology and has revolutionized may other fields in the atomic micro scale. I provided links to PO about his interview of press conference showing that ALD is just the counter part of Dr Suntola's main theoretical interest in the cosmic level of GR/QM unification where he already has disputed several Nobel level mistakes since 1970's - readily confirmed in my fields of array calculus and photogrammetry & geodesy. The only response from PO was: Is suntola some kind of yoghurt? And rrMousie almost choked on this JD yoghoord by laughing his lungs out - until JD escaped the PO building.
" So , annoyingmousie is a freaking hypocrite. Using technology based on DR/QM physics, "
You cannot build any technology, such as GPS, GoogleEarth, Bing Map etc without knowing its underlying theory. Traditional GR community has toted that GPS were not possible without GR spacetime and distance concepts. Exactly the opposite is true based on the MISTAKEN BELIEF of GR as already known by GPS pioneers who happened to be my mentors. I explicitly linked some papers from past seminars of the Finnish natural science society about the explanation of real (vs Einstein thought experimental) atomic clocks developed since 1970's - the DU based GPS proof why Einstein generation of GR/QM was fooled is the 'conspiracy of Nature' or epicycle mistake of eternal constancy of c. This mistake has taken today's cosmology back to Ptolemy times and the political pressure of academic GR/QM community 'being right' has caused the belief based war of Galileo times. Cause what else is left to respond with to these fruitloops? The reason this topic of re-ionization and fogginess is pertinent to the huge mistake of attempting to interpret this temporary event in terms of the outdated GR vs DU time and distance concepts. The GR based belief of eternal constancy of c puts the 1.1 B yr period to 1.1 B ly or 12.7 B ly from today - with no clue what happened at time -1.1 B yrs before the assumed Big Bang of a religious belief. Note that the DU arrow of time change T4=0 is super-symmetric wrt what happened before the assumed BB, see DU book for details or my past explanations and examples to compute the DU values of c, C4, R4 and T4 at the GR based value of T4= 1.1 B yrs and R4=1.1 B ly. & yet you keep sending out your sales pitch on computer/information systems, based on GR/SR/QM. That you deride as failures. So? How soon can we expect to see DU based technology released? After all? Those "failed" GR/SR/QM, "deeply flawed" Theories (by Real Scientists). Went from theory scrawled on blackboards to working machines, in what? What is the DU theories timetable to achieve working machines? & what will be the differences we can expected for DU tech? As opposed to all these "failed" but "miraculously" working tech we van use? The unified GR/QM theory of DU has worked equally well as any practical application based on SR, GR or QM technologies within agreement of 18 decimals - so far, until 1970's these applications have been bound to our local Earth or Sun centered energy frame. One of the first GR proofs of Mercury perihelion advance actually proves that GR and its equivalence principle is WRONG - the Mercury is still there after some 4B yrs ago birth of our Solar system! DU found the mistake in derivation of the perihelion advance where the increase of its orbital radius per period is negligible during some 500 M early years until Mercury were thrown out from Solar system. If you have read my past posts you should know that there are 5-10 similar overlooked flaws or corollaries caused by GR/QM postulate of eternally constant c, including GPS, SN1a and cosmic mapping technologies. "During reionisation, when the universe transitioned out of the cosmic 'dark ages', the space between galaxies was filled with a plasma of ionised hydrogen with a temperature of about 10,000˚C. This is puzzling because fifty million years after the big bang, the universe was cold and dark. It contained gas with temperatures only a few degrees above absolute zero, and no luminous stars and galaxies. How is it then that today, about 13.6 billion years later, the universe is bathed in light from stars in a variety of galaxies, and the gas is a thousand times hotter?" Answering this question requires a neo-epicycle.